Home / Editor's Choice, Forum and discussion, Lifestyle, Politics / Curvy Senator MILLICENT OMANGA brags about her beauty and why she doesn’t wear make–up! Curvy Senator MILLICENT OMANGA brags about her beauty and why she doesn’t wear make–up! Thursday, February 07, 2019 - Nominated Senator Millicent Omanga has revealed that she doesn’t wear make-up like other celebrities and female politicians. Speaking during a radio interview, the curvaceous legislator, who earns a basic salary of Sh710, 000 every month, said that she finds make-up products too expensive. “I don’t apply make-up because I am beautiful beside it’s very expensive. I would rather buy a mattress and take it to Majengo (slums), rather than buy the expensive makeup,” Omanga stated. 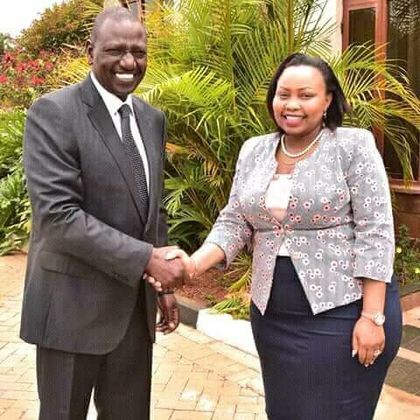 On the same breath, she set the record straight on claims that her life changed when she met DP Ruto in 2013 and was appointed a director of the Kenya Electricity Generating Company (KenGen) at a time she was trying to make ends meet in Nairobi by hawking bed sheets. On the bed sheet story she said: “It wasn’t bed sheets only but you understand the social media.